Bloomberg is a necessary app for business people. It not only gathers and provides you with financial news but also tracks stocks with an impressive interface and it’s free. 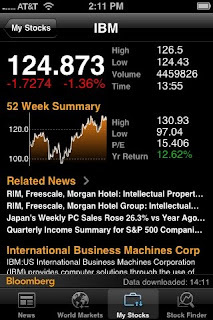 Bloomberg contains a read-only news-feed and statistics on various exchanges throughout the global markets. You can simply enter the company name into the stock finder and find there highs, lows, tables, graphs and charts with the data about a particular company. If you are interested you can add it to your portfolio – My Stocks and keep track of the stock price with a stock chart and links to news for a particular stock. Thus you will always be supplied with necessary and useful information about stock markets, leading and lagging companies, their descriptions etc. as soon as you enter the company name into the stock finder.